Brought to Charlotte by a couple of musical moms (Carrie and Phyllis) passionate about passing along their families' tradition of music making, the Music Together program started in the Charlotte area in 2000. Since the early days, our center has grown and grown, from one location to nine, from one teacher to up to thirteen. Charlotte families of young children have been drawn to the program for lots of reasons, the same that attracted those first two moms years ago: good music, like-minded people, a desire to pass on and foster a love of music in their own children, an opportunity to connect with their children and other families, the experience of making music, reconnecting with their own innate musicality, remembering the fun and joy of community singing and dancing, and most importantly, having uninterrupted and focused fun with their kids for 45 minutes, once a week. It is the sincere desire of Music Together of Charlotte for every family to bring the joy of singing, dancing and inventing music into their own home. Our goal is to be the model and facilitator to lead families in this direction. 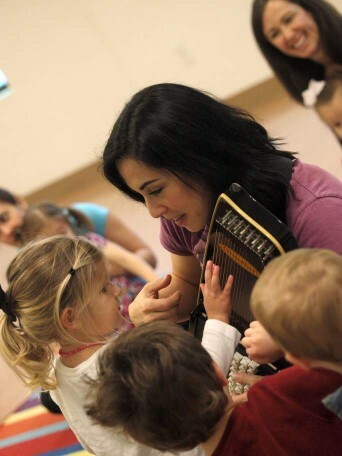 Families receive a new CD each semester and an illustrated songbook that’s filled with music-making ideas for spontaneous music play beyond the weekly classes.